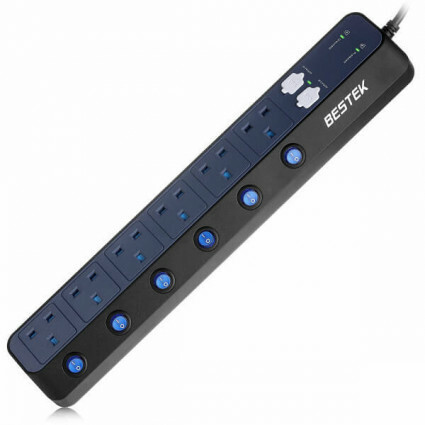 BESTEK 4-USB surge protector has 6 individually switched AC outlets, perfect for home and office use. Surge protected and wall-mounted, the strip is flexible and easy to use. Include 6 outlets and 4 USB ports, can charge up to 10 devices simultaneously; individually switched outlets, energy saving and convenient. 4 smart identification USB ports automatically detect and deliver the optimal current with mx 2.4A each port. 900J strong surge protection protects your devices against surges and spikes. Fully protected against overloading, overheating, short-circuit; outlet safety shutters protect kids from electricity shock. The strip can be mounted on the wall with included holes, saving space. Please ensure that the total power of charging appliance is under rated 3250W. Please keep the extension lead away of children. Do not operate the extension lead near the rain or wet areas. Do not place the extension lead or devices near high-temperature or other severe environments.